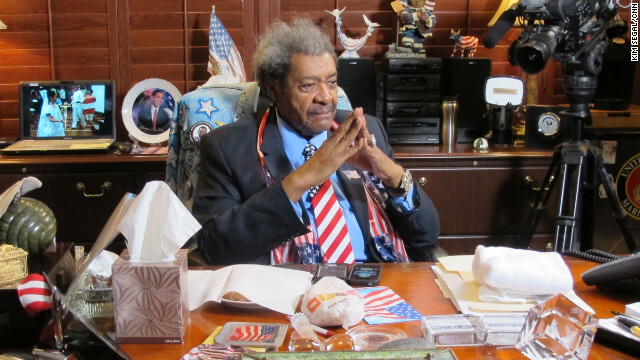 This evening Don King sits down with Piers Morgan for an exclusive, energetic and engaging interview. Known for his big coif and larger-than-life brand of bravado and showmanship, the legendary boxing promoter who's matched up legendary fights for Muhammad Ali, Mike Tyson and Evander Holyfield, will likely run the gamut in conversation topics including sports and politics and even his ambitions for a boxing match in North Korea. Also on the program, Jack Hanna discusses the dangers of lions and CNN's Poppy Harlow and conservative radio host Ben Ferguson join Morgan for his ongoing discussion on guns in America. Tune in this evening at 9 as "Piers Morgan Tonight" addresses the most trending topics of the day. Capitalism as it exists today is radically incompatible with democracy. Noam, youre the epitome of what is wrong with liberals. All you do is criticise, spout some peace loving, idealistic bollox, while not comprehending that there are real problems, with real solutions? What is your alternatives to capitalism? Please, provide a solution? I used to be a fan of yours, then I grew up. An economics professor at a local college had recently failed an entire class. That class had insisted that Obama's socialism worked and that no one would be poor..., a great equalizer. The second test average was a D! No one was happy. When the 3rd test rolled around, the average was an F. As the tests proceeded, the scores never increased as bickering and blame resulted in hard feelings and no one would study for the benefit of anyone else. Dear,mr.morgan while u were talking with mr.hanna short video was lion in cage and the lady was plaing with animal privat part not joking is true maybe lion was attacked other woman and killed her because of her wrong doing ? Haha lol. Take care. What a vile comment. I cannot believe these people actually exist!! Piers Morgan , I thought that I was going to finally hear the main culprit behind the illegal gun trade. The informant saying that criminals don't care about laws, he forgot to mention that there's people who can legally qualify to purchase a gun who don't either. Those firemen in New York would more than likely be still alive if a person WHO QUALIFIED LEGALLY TO PURCHASE A GUN would have never bought the guns for the guy who killed those firefighters. So Piers , when are you going to do a story on straw purchasing??? If you need a source check out "how criminals get guns" at http://www.pbs.org/frontline. MY GOD!!!! HOW CAN THESE IDIOTS LIKE DON KING, STONE, PENN COME OUT AND SAY THAT CHAVEZ WAS A GREAT GUY WHO CARED FOR THE POOR???? THE GUY WAS A TERRORIST, A TRAITOR WHO TRIED TO OVER THROUGH THE GOVERNMENT BACK IN 92 AND WAS GOING TO KILL TE PRESIDENT .... MANY DIED BECAUSE OF THIS.... HE FINANCED TERRORISM IN COLOMBIA PALLED WITH KNOWN TERRORISTS, THROUGH AWAY MILLIOND OF DOLLARS GIVING THEM TO FRIENDS WHILE THE COUNTRY FELL TO PIECES.... GO OUT TO THE POOR AREAS OF CARACAS AND SEE NOTHING HAS IMPROVED ... MY GOS PEOPLE WAKE UP!!!! Sandy hook victims were killed by hand guns, not by assault rifles. The NRA does ask for immediate background checks. An assault rifle is not a machine gun. The ak and bushmaster type rifles only shoot one bullet per trigger pull. Sorry Piers i'm not a fan of Don King I believe he is a slime ball!